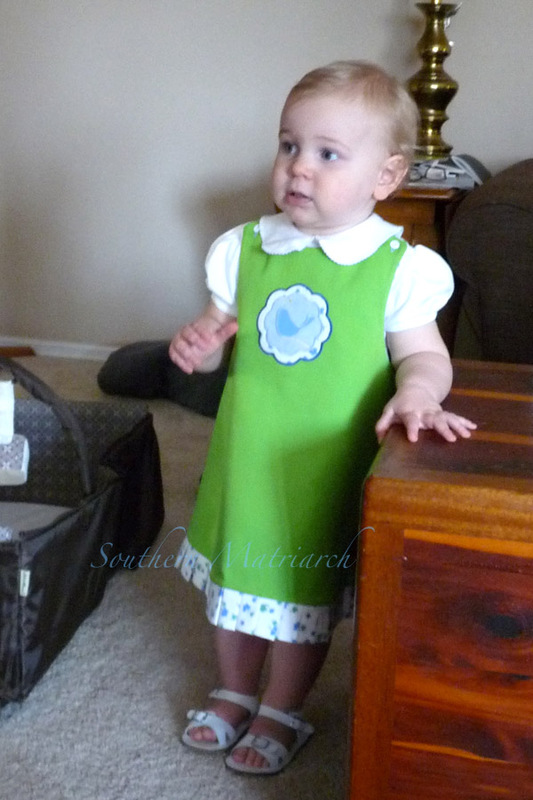 Mommy was taking the babies to the parade today and she wanted something green. I knew I couldn't conquer much but maybe a Children's Corner "Lucy" was achievable. She helped by getting the fabric ironed. I love a heavy iron until it weighs too much to lift, and she helped cut out the pattern. It is reversible and I purposely didn't embroider a shamrock on it, so Princess will get lots of wear out of it. The green pique is left from last year's Mardi Gras dress. The floral twill was out of the closet. Not sure where or when it was purchased. 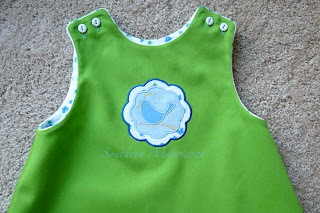 The applique is one I used on some burp cloths before Princess was born. 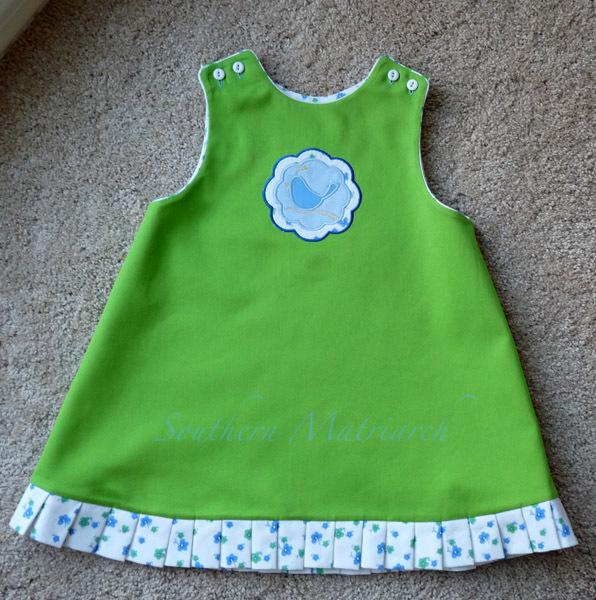 The green in the floral and the pique aren't the best match, but it will do for a play dress. Of course it is piped. I can't not pipe it. I also knew that I didn't have the mobility to pull threads to gather a ruffle, so I rough pleated the ruffle. 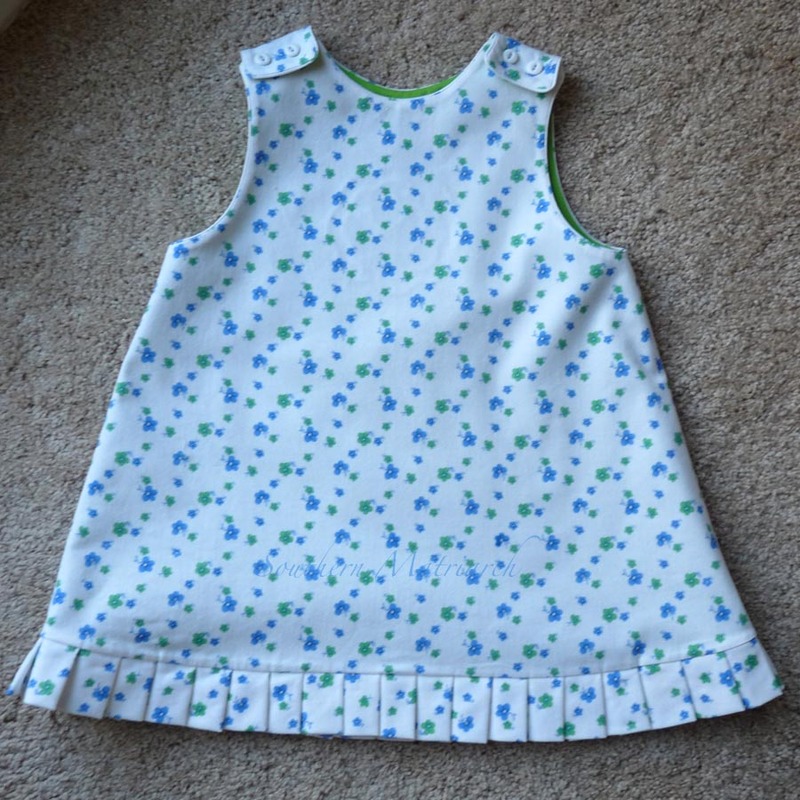 To do that simply prepare your fabric by cutting a length double your desired finished ruffle plus a double seam allowance. So since I wanted a one and a half inch ruffle, the fabric is 3.5 inches long. Two lengths are stitched together for width, folded wrong sides together and pressed. 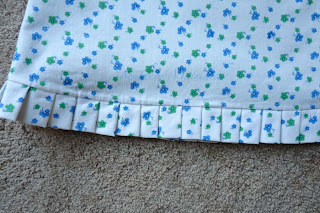 I pinned it to the hem, folded an approximate one inch pleat, pin and repeat. all the way across. Join the ends to make the ruffle into a complete circle. I did not measure or mark the pleats. I was in a hurry and didn't want to over think it. If you look closely you can tell that all of the pleats are not 100% uniform, but to see it as a whole you don't notice it. All dressed for the parade. Our weather in unseasonably warm so a pair of cute sandals and a purchased knit top finish our ensemble. Happy St. Patrick's Day for all of the honorary Irish today. She's adorable! Love the cheery green! It's even cuter on the Princess. The only thing my family celebrated on March 17th was my Dad's Birthday. Ooh, she is just squeezably adorable! Darling little dress, Martha. What is it with us, Martha? I'm like you -- cannot not pipe! Evemarie is adorable and I know you are enjoying this precious time with them.